Have to go pack my bags for Brisbane on the morrow- I have to get up very early to get to the aiport on time. 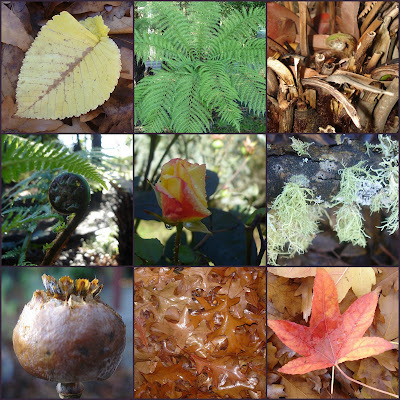 It is almost winter and autumn is giving it's last leafy blast. The tree ferns however are unfurling fronds at a rate of knots. Most of the foliage was burnt in the extreme heat in early February and yet you would barely know from the amazing amount of fern frond growth since then. Even fern trees that to all intents and purposes looked dead when we arrived here are sending out tentative fronds into the world. And even the roses are having a last hoorah. Don't forget if you are in Queensland to come by and say hello when I am at the Art Textile Festival in Birsbane. I shall be minding the My Place exhibition on the Friday and Sunday and will also be demonstrating some printing techniques and for a small cost you can have a go yourself. Also I have had a new lot of books printed- 72 Ways and 72 More Ways- so if you are interested in purchasing just email me. 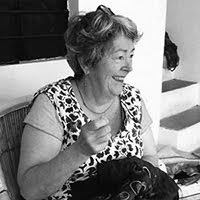 I am back from New Zealand- it really was a flying visit- managed to refrain myself from buying some of the wonderful books, Anne Scott has in Minerva Gallery in Cuba Street in Welllington, though several did nearly come home.... I finished my bushfire/Extreme conditions quilt- even did some more stitching on the aeroplane so that passed the time- and in the end it did come together. It willbe shown at Minerva Gallery along with the work of 10 others interpreting the theme Climate Change in June of this year. But I have been straining at the bit to get working on some icon image ideas I have had. I always did want to include some icon imagery in my Carvanserai exhibition, because I encountered them quite readily whilst in Syria in the Christian churches , but also from places such a Sedanaya and Maloula. The icon images I encountered were definitely of a byzantine or orthodox influence- and I must admit that some fo the stitching I do is heavily influenced byt the richness of colours of byzantine and medieval tiling. So this little image shown here is a prototype- I wanted her to be modern at the same times as byzantine- in the end I think it looks as if the image has had botox . I used this round shape first to see what I had in mind would work but I can see many other shapes that I could work with less icon like but with the potential for stitching and decoration. Tha facial image is inspired by a medieval wood block print. As usual I am rushing at the eleventh hour- have to catch the plane this morning for New Zealand where the quilt has to be delivered and I pick up the My Place quilts.- as I decided to stitch the writing panel to add more texture to the whole piece- this of course added almost two days work to the piece. I found the format challenging- 50 cm x 150 cm ( I know I have worked in long pieces before but they were entirely whole cloth and different considerations come into play). One of the topics that has been talked about in the last few days at the Royal Commission into the bush fires has been the "extreme conditions"- and it is what I wrote about in the written panel- the conditions had never been encountered before and extreme conditions like this are a sign that things are changing. And as I speak Queensland is again experiencing bad floods- the second time in seven months. Thank you for the lovely comments about the machine stitched piece- I must admit it did whet my appetite to make some more pieces and it's very frustrating that the machine has decided to spit the dummy so to speak. Anyway it has meant instead of going into diversion mode I have actually been stitching on my climate change piece and it's funny how the stitching is dictating the forms. I had not expected that the right hand side woud turn into such distinct contrasts- I am not sure what I was really thinking or planning for that matter- but once the stitching went in around the tie dyes the rest of the piece is coming together. I am working on the top right hand corner right now and that is turning out way differently then I had imagined when I burnt the holes in the fabric. 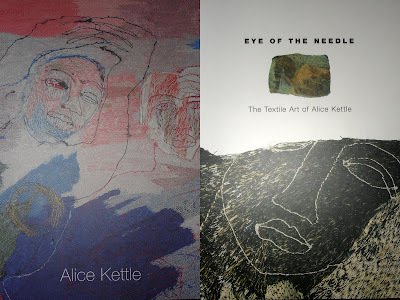 I have been sooo inspired by the books I purchased on the work of Alice Kettle- her stitching is phenomenal and the way she uses it to create an image is very inspirational. She does use an industrial machine but just looking at her work inspired me to try stitching really heavily. It has thrown the timing out on my machine which has always been dodgy ( backs of my work are rather imperfect) and is giving me reason to think I might just go and trade my machine in, because every time I set it to a heavy workload the timing flips out and it's not as if the provider of a service is close by. nor are they cheap. Work is progressing on my Climate Change quilt. The panel on the left is lutradur- which unfortunately has a sheen to it when photographed because of the flash, but which in the flesh has an almost felt like appearance. It has writing on it which I transferred like a journal page- recollecting my feelings of that day and some of the facts- the temperature, the conditions and the aftermath. It measure s50 cm by 150 cm long- quite challenging design wise. I debated a lot with myself acknowledging the human toll- was it trite, was I treading on sacred ground? but in the end these people were the human toll for a tragedy which was far greater than any other we have seen in conditions that were far worse than any we have experienced before here in Victoria- to leave them out somehow denied that this very real tragedy speaks of the way we must change our lives- if only to honour them- so I chose even sided crosses as they appear through all cultures and religions. I had thought intitially when thinking about this quilt ( before the bushfires) to work with the theme - yes but does it hurt?, as some people seem to do so little until they are actually touched or impacted upon- so many of the things we can do actively will be good for all of us and even our personal budgets regardless of how we actually feel about climate change as a political issue. But since the fires the loss of human life and homes and pets and so many things- the answer can only be yes it does hurt- a lot- and res ipsa loquitur- we must change so that we can have some hope of avoiding tragedies on this scale in the future. Yes I am in avoidance mode, but in the spirit of still calling it work I have made a video of my Caravansearai Exhibition entitled Caravanserai: A Travellers' Tale- showcasing the work and inspirations. And I am not going to New Zealand next weekend ( I was getting ahead of myself) but the weekend after- which means I do have time to hand stitch my Climate Change quilt. I also have to do a brochure for the classes I teach as I intend to do some workshops in Gellibrand. I am also close to getting my on-line lino-cutting course eset up- hopefully for a start in June. I have been pondering my quilt for the Climate Change exhibition to be held at Minerva Gallery, in Wellington in June- it's like I have almost forgotten how to work. I looked at lots of issues and even raised some of them in the blogging process but in the end I couldn't get the Black Saturday fires out of my mind. It was a totally devastating day on so many leveles ,but ultimately it also spoke of the very real changes we have experienced in our climate- it was the hottest day in our white recorded history- it was 47 degrees Celsius before the change came and when the change came it brought mini tornadoes with it- I have never seen tree branches as big as trees hurling in the air like matchsticks. The fire index was 6- three times higher than Ash Wednesday and higher than any other time since records have been kept. That alone says a great deal about what happened on that Saturday. The week prior we had experienced three consecutive days of 44 degrees celsius- also an event that has never occured in white recorded history in this part of Victoria. Yes some of the fires were lit, not all though, but no one was ever going to contain them on that day. So the quilt will be about fire and what i wrote about it in my journal. Anyway this is what I have pinned thus far-it will need lots of hand stitching I think- but do I have time??? I am going to New Zealand next Friday and it's supposed to be done by then. My class at the Textile Art Festival in Brisbane is definitely going ahead. I will be teaching transfer printing and stitching ( ie working with lutradur)- there are still soem places if you are interested- just follow the link. Yesterday these spools of rayon thread turned up from the Handweavers Studio in London- I use them for stitching in my travellers blanket.They are lovely to hand stitch with and are quite economical to buy- I just told them a range of colours and this is what turned up! I tie dyed this piece of fabric for my climate change quilt- I am still sampling ideas and each sample is quite dark- maybe that is what is needed- more work to be done today! These two books showcasing the work of Alice Kettle arrived in the post yesterday- I am so looking forward to having a good look at them once I get some work done on my climate change quilt! I swapped these luscious threads for one of my small pieces whilst in Tasmania. They are hand dyed by Madhi Chadler and they come in a wonderful array of colours as you can see. Madhi sells the threads for $5 per skein or 10 skeins for $40 ( plus postage of course). Unfortunately she does not have a website but if you are iterested let me know and I shall pass any enquiries onto Madhi. Ohh and one thing I haven't mentioned before , but I am a firm believer in once you put information out there things follow- plans are well under way for the year we intend to spend in France in 2010. We shall be staying a small distance north of Montpellier- and if you are interested in organising any workshops in Europe whilst I am there please contact me. We will also be doing residential workshops at the placewhere I am staying, which has good studio facilities. So if you are at all interested in partaking of those please let me know and I would also appreciate some feedback on what you would like to learn or do in such workshops? And would any french person like to come and stay at my house- soon- my daughter really needs to practice her french for VCE?? ?